A cook is nothing without his or her knives. You've got the tools, but after a few too many Food Network marathons, you've noticed you haven't quite got the skills. That's why you need The Art of the Knife. 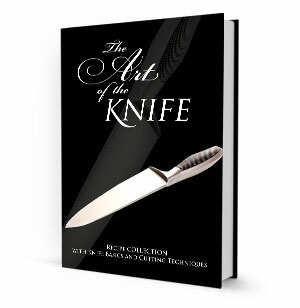 This 240-page book includes information on choosing, using and maintaining your knives. You'll love the lessons on skills and techniques for using each of your different knives correctly: Chopping, mincing, shredding, dicing and more. Then try your hand at one of more than 200 recipes that are included in the book. Graduate from good to great with knife skills! Knives are so much a part of a cook's work that it is impossible to imagine a cook at work without them. From the versatile chef's knife to more specialized knives, many cooks develop a strong and personal attachment to the knives they use in their kitchens. The 240-page Cookbook includes over 200 mouth-watering recipes such as Blue Cheese and Bacon Stuffed Pocket Chicken or Toasted Garlic Rice with Fresh Herbs. It's time to chop your way to something new and delicious!